Abstract: The Permian Malužiná Formation and the Pennsylvanian Nižná Boca Formation are Upper Paleozoic vol- cano-sedimentary complexes in the Hronicum nappe system. Sandstones, shales and conglomerates are the dominant lithological members of the Malužiná Formation sequence. Detrital monazites were analysed by electron microprobe, to obtain Th-U-Pb ages of the source areas. The majority of detrital monazites showed Devonian-Mississippian ages, ranging from 330 to 380 Ma with a weighted average of 351 ± 3.3 (2 σ), that correspond well with the main phase of arc- related magmatic activity in the Western Carpathians. Only a small portion of detrital monazites displayed Permian ages in the range of 250—280 Ma, with a significant maximum around 255 Ma. The weighted average corresponds to 255 ± 6.2 Ma. These monazites may have been partially derived from the synsedimentary acid volcanism that was situ- ated on the margins of the original depositional basin. However, some of the Triassic ages (230—240 Ma), reflect, most likely, the genetic relationship with the overheating connected with Permian and subsequent Triassic extensional re- gime. Detrital monazite ages document the Variscan age of the source area and also reflect a gradual development of the Hronicum terrestrial rift, accompanied by the heterogeneous cooling of the lithosphere. Abstract: Ammonoid mass occurrences of Late Triassic age were investigated in sections from Asagiyaylabel and Yukariyaylabel, which are located in the Taurus Platform-Units of eastern Turkey. The cephalopod beds are almost monospecific, with > 99.9 % of individuals from the ceratitic genus Kasimlarceltites, which comprises more than hun- dreds of millions of ammonoid specimens. The ontogenetic composition of the event fauna varies from bed to bed, suggesting that these redeposited shell-rich sediments had different source areas. The geographical extent of the mass occurrence can be traced over large areas up to 10 km2. Each of the Early Carnian (Julian 2) ammonoid mass occur- rences signifies a single storm (e.g. storm-wave action) or tectonic event (e.g. earthquake) that caused gravity flows and turbidity currents. Three types of ammonoid accumulation deposits are distinguished by their genesis: 1) matrix-supported floatstones, produced by low density debris flows, 2) mixed floatstones and packstones formed by high density debris flows, and 3) densely ammonoid shell-supported packstones which result from turbidity currents. Two-dimensional calcu- lations on the mass occurrences, based on sectioning, reveal aligned ammonoid shells, implying transport in a diluted sediment. The ammonoid shells are predominantely redeposited, preserved as mixed autochthonous/parautochnonous/ allochthonous communities based on biogenic and sedimentological concentration mechanisms ( = in-situ or post-mortem deposited). This taphonomic evaluation of the Kasimlarceltites beds thus reveals new insights into the environment of deposition of the Carnian section, namely that it had a proximal position along a carbonate platform edge that was influenced by a nearby shallow water regime. The Kasimlarceltites-abundance zone is a marker-zone in the study area, developed during the drowning of a shallow water platform, which can be traceable over long distances. Abstract: New Anomopterella Rasnitsyn, 1975, wasps from the Jiulongshan Formation (Bathonian/Callovian) at Daohugou (Inner Mongolia of China), with well-preserved wings, body, antennae and tarsi, document relationship among species and enhance our understanding of the morphology of the extinct family Anomopterellidae Rasnitsyn, 1975. Based on eight well-preserved specimens, we describe, A. pygmea sp. n. and A. brevis sp. n., describe new materials of A. ovalis Li, Rasnitsyn, Shih & Ren, 2013, and A. ampla Li, Rasnitsyn, Shih & Ren, 2013, emend the genus in Anomopterellidae (A. pygmea sp. n. with toruli and eyes), and provide a determination key to species of the genus, including four specimens outside the formal classification. Abstract: Upper Jurassic marine deposits are either rarely preserved due to erosion or buried under younger sediments in the Bohemian Massif. However, fossil assemblages from a few successions exposed in northern Bohemia and Saxony and preserved in museum collections document the regional composition of macro-invertebrate assemblages and thus provide unique insights into broad-scale distribution and migration pathways of ammonites during the Late Jurassic. In this paper, we focus on the systematic revision of ammonites from the Upper Oxfordian and Lower Kimmeridgian deposits of northern Bohemia and Saxony. The ammonites belong to two families (Aulacostephanidae and Cardioceratidae) of high paleobiogeographic and stratigraphic significance. Six genera belong to the family Aulacostephanidae (Prorasenia, Rasenia, Eurasenia, Rasenioides, Aulacostephanus, Aulacostephanoides) and one genus belongs to the family Cardioceratidae (Amoeboceras). They show that the Upper Jurassic deposits of the northern Bohemian Massif belong to the Upper Oxfordian and Lower Kimmeridgian and paleobiogeographically correspond to the German-Polish ammonite branch with the geographical extent from the Polish Jura Chain to the Swabian and Franconian Alb. Therefore, the occurrences of ammonites described here imply that migration pathway connecting the Polish Jura Chain with habitats in southern Germany was located during the Late Oxfordian and Early Kimmeridgian in the Bohemian Massif. 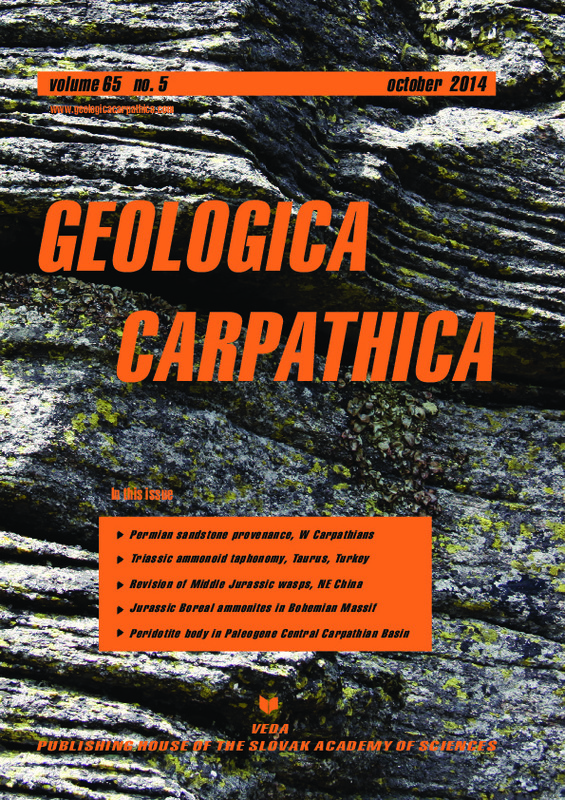 Abstract: We studied representative samples from a peridotite body situated NE of Sedlice village within the Central- Carpathian Paleogene sediments in the Central Western Carpathians. The relationship of the peridotite to the surrounding Paleogene sediments is not clear. The fractures of the brecciated peridotite margin are healed with secondary magnesite and calcite. On the basis of the presented bulk-rock and electron microprobe data, the wt. % amounts of mineral phases were calculated. Most of calculated “modal” compositions of this peridotite corresponds to harzburgites composed of olivine ( ~ 70—80 wt. %), orthopyroxene ( ~ 17—24 wt. %), clinopyroxene ( < 5 wt. %) and minor spinel ( < 1 wt. %). Harzburgites could originate from lherzolitic protoliths due to a higher degree of partial melting. Rare lherzolites contain porphyroclastic 1—2 mm across orthopyroxene (up to 25 wt. %), clinopyroxene ( ~ 5—8 wt. %) and minor spinel ( < 0.75 wt. %). On the other hand, rare, olivine-rich dunites with scarce orthopyroxene porphyroclasts are associated with harzburgites. Metamorphic mineral assemblage of low-Al clinopyroxene (3), tremolite, chrysotile, andradite, Cr-spinel to chromite and magnetite, and an increase of fayalite component in part of olivine, indicate low-temperature metamorphic overprint. The Primitive Mantle normalized whole-rock REE patterns suggest a depleted mantle rock-suite. An increase in LREE and a positive Eu anomaly may be consequence of interactive metamorphic fluids during serpentinization. Similar rocks have been reported from the Meliatic Bôrka Nappe overlying the Central Western Carpathians orogenic wedge since the Late Cretaceous, and they could be a potential source of these peridotite blocks in the Paleogene sediments.